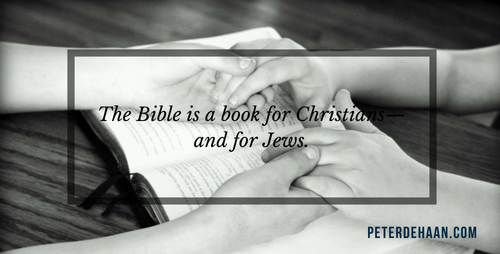 The Bible isn’t really a Christian book. It’s more so a Jewish book. Without question the Old Testament of the Bible is Jewish. It’s about Jews, and it’s for Jews. It looks at their faith journey as a people, records their history, and provides the foundation for their beliefs. However, the Old Testament also looks forward to a savior. That savior is Jesus. Many people call his followers Christians. And many use the label Christianity to describe the faith practice that these believers developed. The New Testament talks about Jesus and the movement his followers started, but it’s still more of a Jewish book then a Christian book. It’s about Jews, and it’s for Jews. Fortunately for us non-Jews, it’s also for Gentiles. Except for Luke, all the writers of the New Testament are Jewish. And remember, Jesus is Jewish. Let that sink in. The New Testament has a Jewish basis, even though it shows how Jesus fulfilled the Old Testament prophecies to create something new. Yes, Christians—followers of Jesus—do revere the Bible, as we should. And for most of us that makes it a Christian book, the ultimate Christian book of all time. However, we must not lose sight of the fact that, at its core, the Bible’s foundation is Jewish. I love the Bible for it is the foundation of my faith. I love the people in the Bible—who are mostly Jewish—for they are the predecessors of my spiritual practices. The Bible is my faith foundation, even though it’s essentially a Jewish book. Read and study the Bible for what it is, not for what you want it to be.